Lack of sleep goes hand-in-hand with having a child. 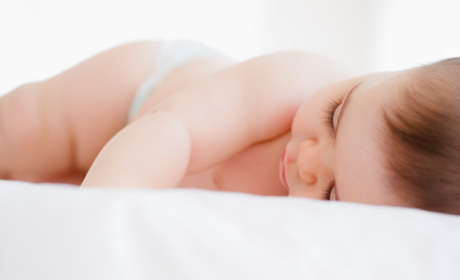 In fact, sleep problems are one of the most common concerns among parents of young children. Whether it’s a newborn fussing at having to call it a day or a toddler having a tantrum from exhaustion, bedtime can often feel like an uphill battle. Fortunately, with a consistent nighttime schedule, it can get better. JOHNSON'S® 3-step BEDTIME® routine can help your baby drift off with ease and sleep better throughout the night—which means a good night’s sleep for you, too. Step 1: Add extra gentle JOHNSON’S® BEDTIME® Baby Bath to the water. A warm soak, combined with this blend of calming aromas, will soothe your baby and get her ready for sleep time. Step 2: JOHNSON’S® BEDTIME® Baby Lotion partnered with a gentle massage also helps your baby settle in for a good night’s sleep. The aromas in this lotion are released through your massaging motions, and help lull baby to sleep. Her skin is left soft and smooth, plus the mild formula is hypoallergenic. Step 3: Finish your baby’s bedtime routine with a quiet bonding exercise, like reading her favourite book or singing a sweet lullaby. The sound of your voice alone can work magic. Telling her stories about your day, making up your own fairy tale or even reading her one of your books (because you need a break too), can be soothing and help her get to dreamland.